Your school may already have partnerships with various businesses or non-profits organizations - great! Make sure to contact these groups and invite them to work with you on Love Our Schools Day. This is also a great time to asset map the community around the school and identify some groups that you wish to work with. Once you have a leadership team, and project goals in mind, it’s time to invite others to the table! Try for a diverse group with the whole community represented! When talking with these groups, discuss how this partnership can be mutually beneficial. 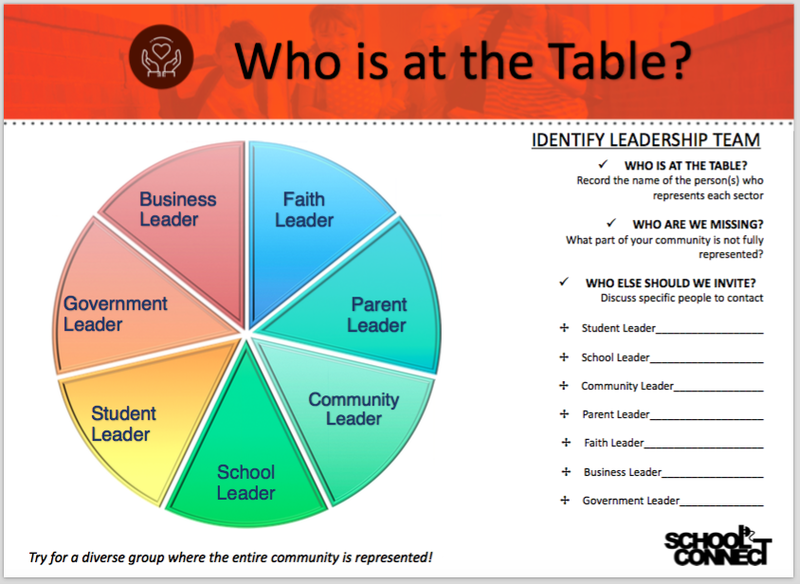 Share strengths of the school, areas of growth, and how together we can help achieve growth for the entire community! Email School Connect for a Potential Partner List within a 5 mile radius of your school! 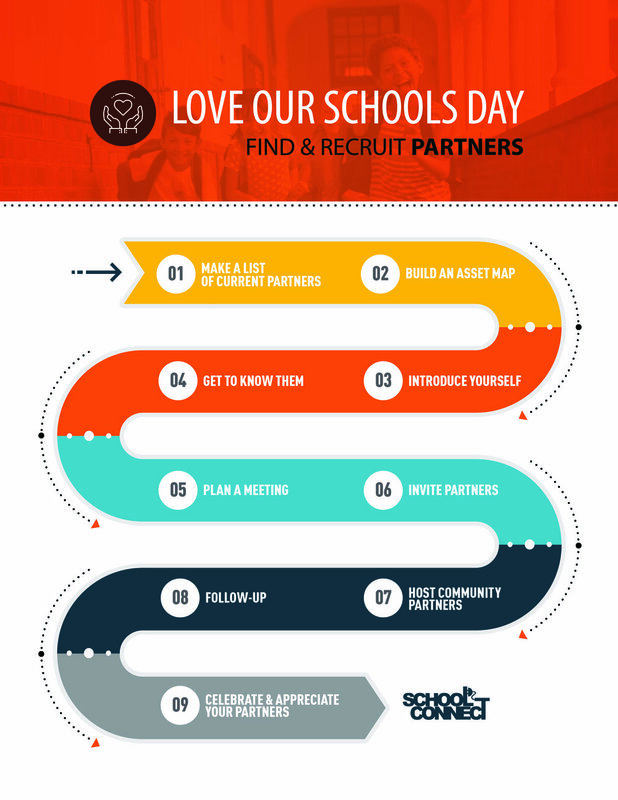 Now that your leadership team has identified the projects for Love Our Schools Day and the community partners have been contacted, set a time to plan the projects for the day. Discuss what resources each group has to offer and who can supply what for the projects. This is where it comes in handy to have the facilities manager present who can easily provide information on what the school already has. Make sure to complete any paperwork the district may require like a facilities use form or a site improvement form and have that turned in before Love Our Schools Day. Create project lists on giant sticky notes or card-stock to use on the day of the event so volunteers can mark off the projects as they complete them. Check out this example site improvement form from the Washington Elementary School District and see if your district has something similar! Use the project goals worksheet to plan the projects for the event. With your projects planned, now it is time to post them to the School Connect Web App so volunteers can begin to sign up for the projects and learn more about what the school is doing. This is also an easy way to plan for how many people will be on your campus so the necessary number of supplies can be provided. 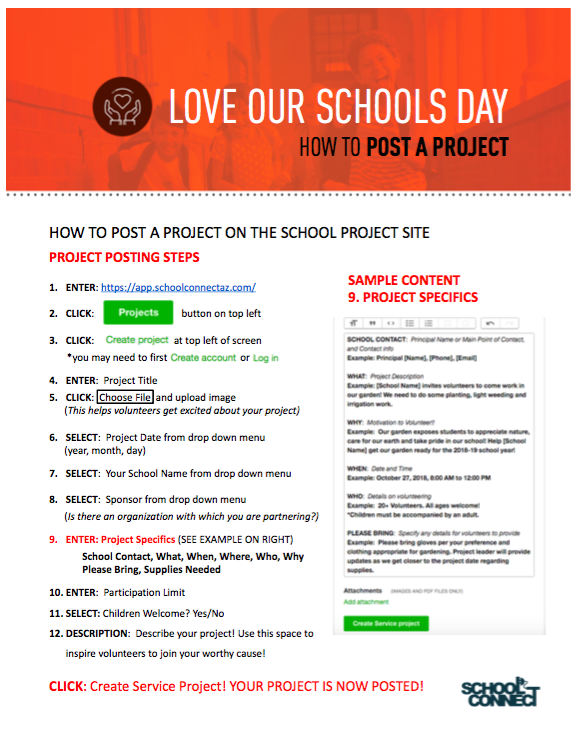 Use the videos and document below for help on signing up for a School Connect log in and how to post your projects. How to sign up for a log in. How to view and edit rosters.